Design Squad Nation - Lots of hands on projects, and a great place for kids to collaborate with other students from around the country. Treasure Grab - Kids investigate magnetism with this measuring construction project! Indoor Slingshot - Angle Exploration and potential / kinetic energy! Kids measure the distance their object is propelled. What angle worked best? Air Cannon - Estimate and measure, while exploring air pressure. Kids blow up a bag, smash it, and a pom pom ball goes flying! 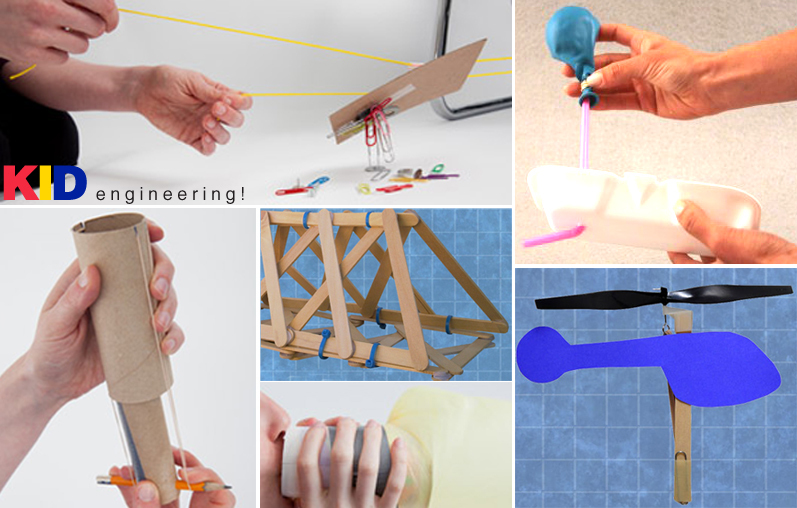 WYE_Lance has a special showcase of kid engineering projects featured on Instructables: Project-Based Engineering. Truss Bridges - Kids explore symmetry and angles as they create a unique popsicle stick structure. Rubber Band Helicopter - How high will it go? How long will it stay up? Kids investigate the power of air, as they estimate and measure the distance their boat floats!